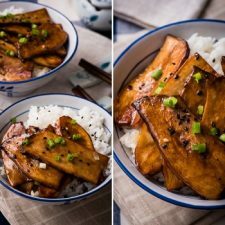 A super easy way to cook king oyster mushrooms to make a vegan dish that tastes better than meat! These teriyaki king oyster mushrooms are not a typical stir-fry dish. 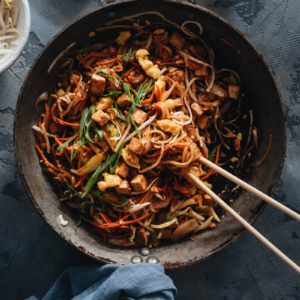 Conventional Chinese style stir-frying requires a powerful gas stove and a cast iron wok. If you employ the correct combination of a very short cooking time and extremely high heat, the ingredients will be cooked just right. 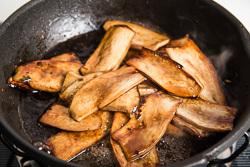 They stay fresh and crisp, charred on the surface with a moist texture, and infused with a great flavor that you can only get from a wok. However, this method is not practical for everyone. 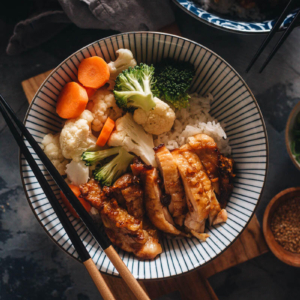 What if you don’t have a wok or a gas stove, or simply don’t want your cooking to be very smoky? 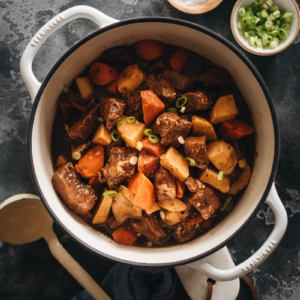 And what if you have trouble nailing down the right cooking time or meticulously adjusting the heat as required to cook perfect vegetables with that great texture and flavor? Teriyaki king oyster mushrooms provide a perfect solution to all these problems. 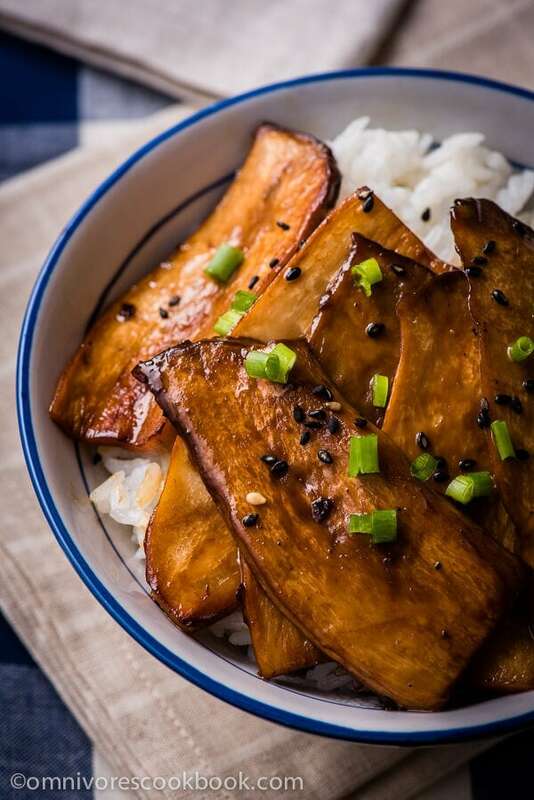 Unlike traditional stir fried dishes, this recipe uses a flat skillet to grill the mushrooms until crispy, and then quickly braises them in a simple teriyaki sauce to add a rich flavor. The finished mushrooms have a dark color and shiny luster, with a spongy and meaty texture and a sweet, savory, rich flavor. The fresh green onion adds a refreshing citrusy taste. 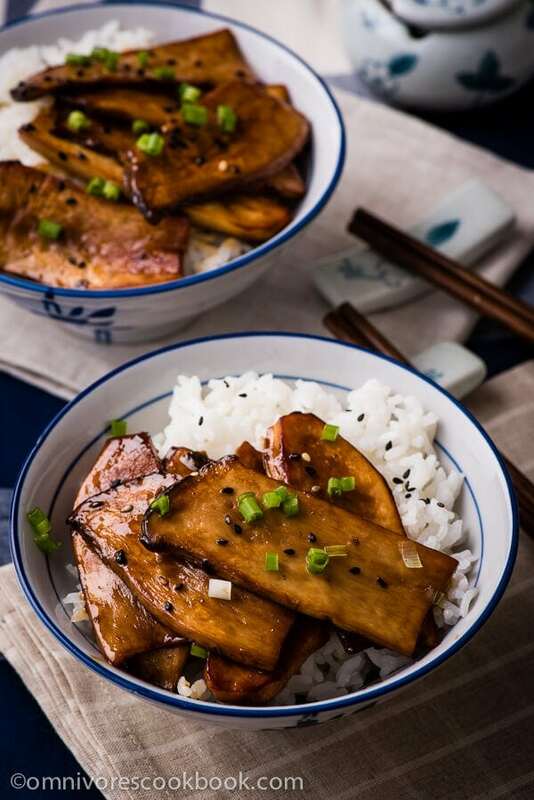 Top freshly steamed white rice with these mushrooms and you have a simple yet satisfying one-dish meal, ready in 30 minutes. Believe it or not, this vegan dish even tastes better than meat. I’d like to extend a big thank-you to my reader Luke, who sent me this delicious recipe from A Life (Time) of Cooking. I tried it and loved it. 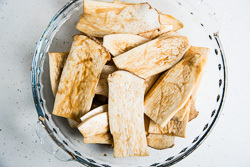 In this recipe, I discovered the secret to cooking perfect king oyster mushrooms – to marinate them first and cook them slowly. 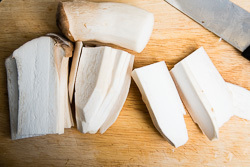 Oyster mushrooms have a drier texture than the average mushroom, and thus are not very suitable for a quick stir-fry. 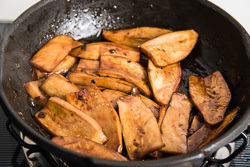 If you cook them over high heat without a lot of oil, the mushrooms will be easily burned on the surface, without any infused flavor inside, which makes it even worse. To add insult to injury, the mushrooms will start to release moisture at the end of cooking, giving you a paradoxically burned, soggy, and utterly flavorless dish. By marinating the mushrooms first, they will be seasoned well and lose some moisture before cooking. Instead of cooking them over high heat, you should grill them slowly until charred and cooked through. In the last step, all the mushroom liquid and seasoning will be added back into the dish, which creates a super rich sauce with basically zero effort. By the way, if you’re cooking mushrooms with a higher liquid content, such as oyster mushrooms, you can refer to my blanch-and-stir-fry method. 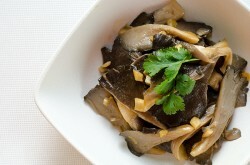 I introduced this method in my easy oyster mushroom stir-fry recipe. In that recipe, the mushrooms are quickly boiled to surrender some of their moisture, then cooked in a simple savory sauce. 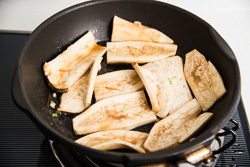 The blanching method helps to cook the mushrooms quickly in the stir-fry, without turning the dish soggy. Back to this recipe, I made a few tweaks to the original. I replaced the mirin with Japanese sake and sugar (you can use this substitution in any Japanese dish). I also slightly adjusted the seasoning, utilizing less oil and fewer ingredients. If you want to use mirin instead, check out the original recipe. If you don’t have sake, you could replace it with cooking wine or vodka (1 teaspoon vodka for 1 tablespoon sake). However, I think sake works best in this dish, because it has a more delicate and sweet flavor. 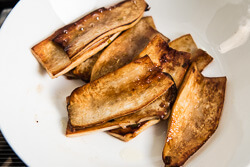 This teriyaki style is my favorite way of cooking king oyster mushrooms now. I hope it becomes yours, too! If you cook this recipe, don’t forget to take a picture and post it on my Facebook fan page. I love seeing your photos! Halve king oyster mushroom lengthwise, then slice into 4mm (slightly more than 1/8 in, double the thickness of a 1-dollar coin) thick slices. Transfer to a big plate. 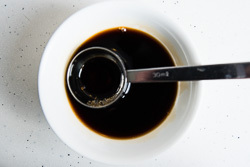 Combine light soy sauce, Japanese sake, and sugar in a small bowl. Mix well. Use a dining spoon to distribute the sauce over the mushrooms. Mix with chopsticks until the mushrooms are evenly covered with the sauce. Marinate for 15 minutes. 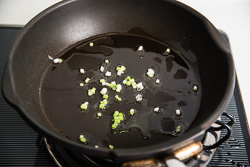 Add 1 tablespoon peanut oil to a nonstick skillet and heat over medium high heat until warm. Add 2 teaspoons green onion and stir a few times. Cook mushrooms in batches. Spread them across the skillet without overlapping them. Save the marinating liquid for later use. Let mushrooms grill without stirring them. When the skillet gets hot, turn to medium heat (or low heat if the skillet starts to smoke). When the bottom side turns golden, flip with chopsticks (or tongs) to grill the other side. Keep grilling and flipping, until both sides turn golden brown, with slightly charred edges. The process took me 8 minutes, but your cooking time will vary depending on the type of stove you’re using. Transfer the mushrooms to a plate and set aside. Add the remaining 1 tablespoon of oil and 2 teaspoons of green onion. Continue to cook the remainder of the mushrooms. The cooking process will be shorter this time, since the skillet is quite hot already. Adjust heat between low and medium to cook the mushrooms slowly, with the skillet remaining hot. The mushrooms should be slightly charred and dehydrated without getting burnt. (I cooked two batches with a 24 inch skillet. You might need to cook more (or fewer) batches depending on the amount of mushrooms and the size of your skillet. Be sure to adjust the amount of oil accordingly. When the last batch of mushrooms is cooked, add the previous batch(es) back into the skillet. Pour the marinade over the mushrooms. Keep cooking over medium low heat until the liquid is absorbed, 2 to 3 minutes. Place the mushrooms onto the steamed rice. Garnish with the remaining 2 teaspoons of green onion and the sesame seeds. I love these mushrooms, so thank you so much for making them with your own twists. Such a gorgeous post. Looks wonderful, don’t we need to add teriyaki sauce ? is there any alternative for Japanese sake ? if we have muslim guest. Hi James, if you follow my recipe, the seasonings will make a teriyaki sauce (yep, teriyaki sauce is super simple to make). You can use chicken stock to replace Japanese sake and the result will still be delicious. But the flavor will be a bit different. A teriyaki sauce requires mirin (sweet rice wine) or rice wine. Happy cooking and hope the result turns out great! I’ve actually never had king oyster mushrooms – but after seeing this recipe… I definitely need to change that! They looks so wonderfully meaty and rich! Is king oyster mushroom a rare thing in the US? Check them out if you see any at the market. I really love their meat texture! I honestly believe you when you say this tastes better than meat. I love mushrooms and this looks incredible! Oh! I am pretty sure you are right about this vegan dish tasting better than meat.. Looks so yummy! Ah this sounds amazing! 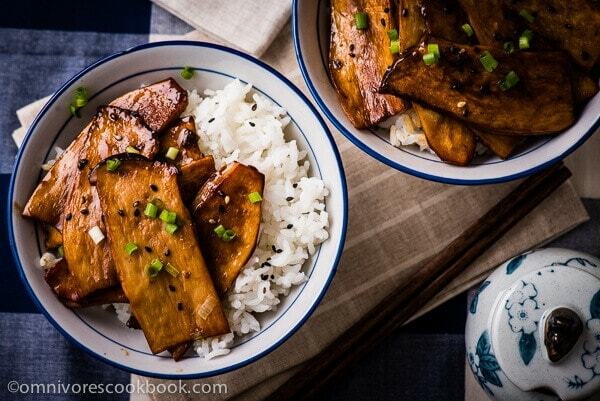 I love mushrooms, but never tried with teriyaki sauce! And thank you for transforming awesome chinese meals into something that we can actually make at home! The mushrooms are browned so nicely. Looks really flavorful! I am sure I won’t miss the meat when eating this rice bowl. So meaty and earthy. Pinning for sure! I’ve been eyeing this up on social media! I would never have thought of cooking mushrooms this way, Maggie! But they look so appetizing and just as ‘meaty’ as true meat! I totally believe that these mushrooms taste better than meat, so juicy and delicious! I made this for dinner tonight and it was incredible! I accidentally bought twice the amount of mushroom I needed but the three of us smashed it, it was so good. I had never had or cooked oyster mushrooms before so this was a great first experience. This recipe sounds fabulous. I will definitely try it. I live in Hawaii and will be getting married in November. I am being given an abundance of king oyster mushrooms as a gift. Our reception will be very casual and just appetizers, mostly Hawaiian and Asian inspired. Is there anything you can think of that I can do in advance, a day or two that would work with these mushrooms? Mahalo for you help in this. Congratulations Debra! I’m glad to hear you’d like to try out this dish. To speak the truth, I have not tried to cook with king oyster mushrooms in many different ways. It has such a nice and meaty texture, so we always use it in the stir fry, or roast it with sauce like this recipe. I think you can deep fry them, use them in the soup, or even pickle them, depends on what type of dish you’re looking for. Although you probably can cook with the fresh mushrooms without too many preps in advance. I want to use a pre-made black bean and garlic sauce instead of teriyaki. should I marinate and cook it the same way? Maggie, thank you for this recipe, which looks like it produces a gorgeous result despite how simple it is. 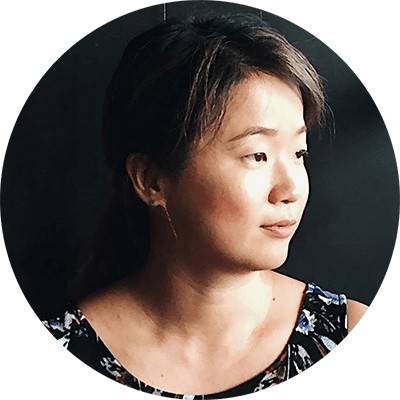 I happen to have both king oyster mushrooms and shiitake right now –– can I use both types together in this recipe? Or should the shiitake be cooked differently? I’m relatively new to these mushroom varieties so I’d appreciate your advice! I found this recipe after making a horrible stir fry with these mushrooms, for the same reasons you have pointed out. This turned out so sooo good! It took some time to cook the pieces. But it’s really worth it. I made it for dinner but couldn’t help sneaking pieces to eat before the meal. Hi Kasey, thanks for your feedback. We’re glad to hear the dish came out well! The prep and sauteing can take a little while… but SO WORTH IT. I can’t believe how easy this was! Just used 1:1 ratio of soy sauce to rice wine, and when I added the leftover marinade to the cooked mushrooms, I also threw in a couple handfuls of shrimp. Didn’t need any extra seasoning, and the sauce that resulted from the water released by the frozen shrimp was thick and delicious. Looking forward to making this again, as well as trying more of your recipes. So much on your site reminds me of childhood and my grandma, and it has given me a new joy and excitement in my cooking. Thank you!